How fast and how profoundly we act to stop climate change caused by human actions, and work to return to a safe climate, is perhaps the greatest challenge our species has ever faced, but are we facing up to what really needs to be done? We have to come to terms with two key facts: practically speaking, there is no longer a “carbon budget” for burning fossil fuels while still achieving a two-degree Celsius (2°C) future; and the 2°C cap is now known to be dangerously too high. No Carbon Budget Left – David Spratt from Breakthrough on Vimeo. For the last two decades, climate policy-making has focused on 2°C of global warming impacts as being manageable, and a target achievable by binding international treaties and incremental, non-disruptive, adjustments to economic incentives and regulations (1). But former UK government advisor Professor Sir Robert Watson says the idea of a 2°C target “is largely out of the window”, International Energy Agency chief economist Fatih Birol calls it “a nice Utopia”, and international negotiations chief Christiana Figueres says we need “a miracle”. This is because, in their opinions, emissions will not be reduced sufficiently to keep to the necessary “carbon budget” (2). The carbon budget has come to public prominence in recent years, including in the Intergovernmental Panel on Climate Change (IPCC) Fifth Assessment Report in 2013, as being the difference between the total allowable greenhouse gas emissions for 2°C of warming, and the amount already emitted or spent. The budget varies according to the likelihood of overshooting the target: the higher the risk, the bigger the budget. 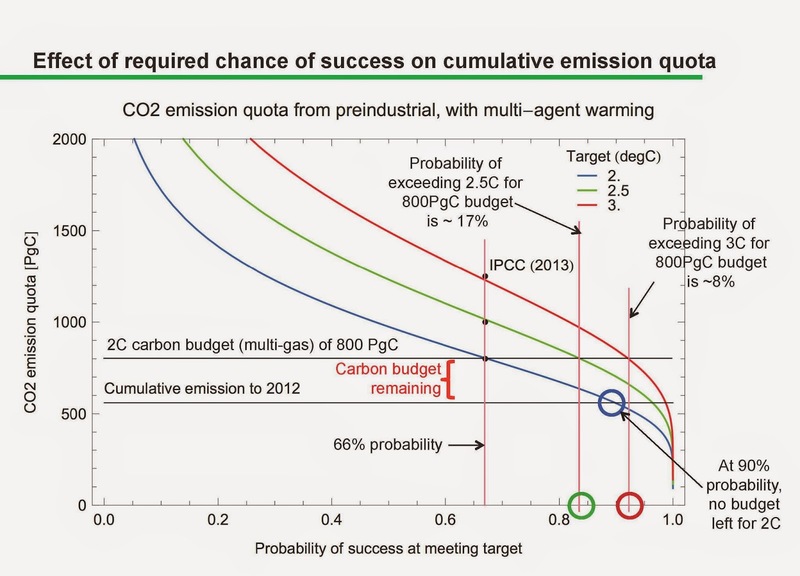 In the IPCC report, no carbon budget is given for less than a one-in-three chance of failure. What is less well understood is that if the risk is low, there is no carbon budget left (4). Climate change with its non-linear events, tipping points and irreversible events – such as mass extinctions, destruction of ecosystems, the loss of large ice sheets and the triggering of large-scale releases of greenhouse gases from carbon stores such as permafrost and methane clathrates – contains many possibilities for catastrophic failure. Ian Dunlop, a former senior risk manager and oil and coal industry executive, says the management of catastrophic risk has to be very different from current processes. As serious, irreversible outcomes are likely, this demands very low probabilities of failure: management of catastrophic risk “must centre around contingency planning for high-impact and what were regarded as low-probability events, which unfortunately are now becoming more probable… Major, high-risk industrial operations, such as offshore oil exploration, provide a model, with detailed contingency planning and sequential barriers being put in place to prevent worst-case outcomes” (5). If a risk-averse (pro-safety) approach is applied – say, of less than 10% probability of exceeding the 2°C target – to carbon budgeting, there is simply no budget available, because it has already been used up. A study from The Centre for Australian Weather and Climate Research shows that “the combination of a 2°C warming target with high probability of success is now unreachable” using the current suite of policy measures, because the budget has expired (6). This is illustrated in Figure 1 where, as we move to the right (greater probability of meeting target) along the blue line which is the 2°C carbon budget, we reach a point around 90% probability (blue circle) where the total budget intersects with what we have already emitted. As well, on-going greenhouse emissions associated with food production and deforestation are often conveniently pushed to one side in discussing carbon budgets. UK scientists have shown that if some reasonably optimistic assumptions are made about deforestation and food-related emissions for the rest of the century, then most emission reduction scenarios are incompatible with holding warming to +2ºC, even with a high 50% probability of exceeding the target. In other words, food and deforestation has taken up the remaining budget, leaving no space for fossil fuel emissions (7). Australian Climate Council member Prof. Will Steffen says the IPCC carbon budget may “be rather generous”. The IPCC report says the modelling used does not include explicit representation of permafrost soil carbon decomposition in response to future warming, and does not consider slow feedbacks associated associated with vegetation changes and ice sheets. Recent research suggests these events could happen well below 2°C of warming, so they should be taken into account, but they are not. Accounting for the possible release of methane from melting permafrost and ocean sediment implies a substantially lower budget (9). This reinforces the need to take a pro-safety, risk-averse approach to the carbon budget, especially since some research suggests that Arctic permafrost may be vulnerable at less than 2°C or warming (10). For all these reasons – that is, prudent catastrophic risk management, accounting for food production and deforestation emissions, and for Arctic sea ice and carbon store instability – the idea of “burnable carbon” – that is, how much more coal, gas and oil we can burn and still keep under 2°C – is a dangerous illusion, based on unrealistic, high-risk, assumptions. A second consideration is that 2°C of warming is not a safe target. 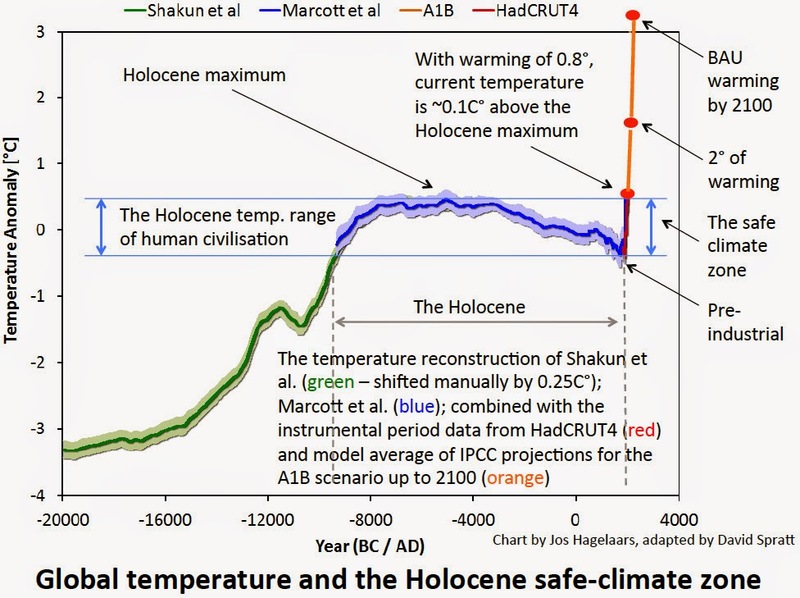 Instead, it’s the boundary between dangerous and very dangerous (11), and 1°C higher than experienced during the whole period of human civilisation (12), illustrated in Figure 2. The last time greenhouse gas levels were as high as they are today, modern humans did not exist (13), so we are conducting an experiment for which we have no direct observable evidence from our own history, and for which we do not know the full result. However, we do understand that many major ecosystems will be lost, a 2°C sea-level rise will eventually be measured in the tens of metres (14), and much of human civilisation and large, productive river delta systems will be swamped. There is now evidence to suggest that the current conditions affecting the West Antarctic ice sheet are sufficient to drive between 1.2 and 4 metres of sea rise (15), and evidence that Greenland will contribute more quickly (16), and they are just two contributors to rising sea levels. It is now clear that the incremental-adjustment 2°C strategy has run out of time, if for no other reason than the “budget” for burning more fossil fuels is now zero, yet the global economy is still deeply committed to their continuing widespread use. We all wish the incremental-adjustment 2°C strategy had worked, but it hasn’t. It has now expired as a practical plan. We now have a choice to make: accept much higher levels of warming of 3–5°C that will destroy most species, most people and most of the world’s ecosystems; a set of impacts some more forthright scientists say are incompatible with the maintenance of human civilisation. Or we can conceive of a safe-climate emergency-action approach which would aim to reduce global warming back to the range of conditions experienced during the last 10,000 years, the period of human civilisation and fixed settlement. This would involve fast and large emissions reduction through radical energy demand reductions, whilst a vast scaling-up of clean energy production was organised, together with the remaking of many of our essential systems such as transport and food production, with the target being zero net emissions. In addition, there would need to be a major commitment to atmospheric carbon dioxide drawdown measures. This would need to be done at a speed and scale more akin to the “war economy”, where social and economic priority is given to what is perceived to be an overwhelming existential threat. After 30 years of climate policy and action failure, we are in deep trouble and now have to throw everything we can muster at the climate challenge. This will be demanding and disruptive, because there are no longer any non-radical, incremental paths available. Prof. Kevin Anderson and Dr Alice Bows, writing in the journal Nature, say that “any contextual interpretation of the science demonstrates that the threshold of 2°C is no longer viable, at least within orthodox political and economic constraints” and that “catastrophic and ongoing failure of market economics and the laissez-faire rhetoric accompanying it (unfettered choice, deregulation and so on) could provide an opportunity to think differently about climate change” (17). Anderson says there is no longer a non-radical option, and for developed economies to play an equitable role in holding warming to 2°C (with 66% probability), emissions compared to 1990 levels would require at least a 40% reduction by 2018, 70% reduction by 2024, and 90% by 2030. This would require “in effect a Marshall plan for energy supply”. As well low-carbon supply technologies cannot deliver the necessary rate of emission reductions and they need to be complemented with rapid, deep and early reductions in energy consumption, what he calls a radical emission reduction strategy (18). All this suggests that even holding warming to a too-high 2°C limit now requires an emergency approach. Emergency action has proven fair and necessary for great social and economic challenges we have faced before. Call it the great disruption, the war economy, emergency mode, or what you like; the story is still the same, and it is now the only remaining viable path. (4) “For a 90% probability of not exceeding 2C of warming the carbon budget had reduced to zero by 2012, using a multi-agent (that is, the well-mixed greenhouse gases, including CO2 and CH4)”, Raupach (2013, unpublished), based on Raupach, M. R., I.N. Harman and J.G. Canadell (2011) “Global climate goals for temperature, concentrations, emissions and cumulative emissions”, Report for the Department of Climate Change and Energy Efficiency. CAWCR Technical Report no. 42. Centre for Australian Weather and Climate Research, Melbourne; Rogelj, J., W. Hare et al. (2011) “Emission pathways consistent with a 2°C global temperature limit”, Nature Climate Change 1: 413-418 show at Table 1 no feasible pathways for limiting warming to 2°C during the twenty-first century with a “very likely” (>90%) chance of staying below the target, without carbon drawdown. (6) Raupach, M. R., I.N. Harman and J.G. Canadell (2011) “Global climate goals for temperature, concentrations, emissions and cumulative emissions”, Report for the Department of Climate Change and Energy Efficiency. CAWCR Technical Report no. 42. Centre for Australian Weather and Climate Research, Melbourne. (18) Anderson, K. (2014) “Why carbon prices can’t deliver the 2°C target”, 13 August 2013, http://kevinanderson.info/blog/why-carbon-prices-cant-deliver-the-2c-target, accessed 19 May 2014; Anderson, K. (2012) “Climate change going beyond dangerous – Brutal numbers and tenuous hope”, Development Dialogue, September 2012; Anderson, K. (2011) “Climate change going beyond dangerous – Brutal numbers and tenuous hope or cognitive dissonance”, presentation 5 July 2011, slides available at http://www.slideshare.net/DFID/professor-kevin-anderson-climate-change-going-beyond-dangerous; plus (7) above. Are you ready to embrace the apocalypse? The Generator Copyright © 2019.